China has a notoriously poor workplace safety record, with rules widely flouted as companies chase contracts and profits. Accidents in factories and on construction sites are common - and China's coalmines are the most dangerous in the world, despite the government's efforts to improve safety standards. Chinese internet-users have questioned whether China's rush to build a modern industrial economy has jeopardised workers' safety. The conditions in foreign-owned factories is generally better than those in state-owned and privately-owned factories. At good factories workers make as much as $200 a month, small by American standard but more than a professor in Beijing gets. Middle-level managers get $400 a month plus a comfortable apartment. Workers at plant run by Intel and Motorola get paid middle class wages, receive to notch training and good bonuses and work in state of the art factories learning valuable skills. In recent years Nike and The Gap have been praised for the way their factories in China have been run. They often have direct control over the facilities that they attempt to make as humane as possible and conduct frequent inspection to make sure everything is as it should be. Nike identifies the factories that produce its products and invites other to check them out. The Gap provides accounting of the factories it inspects and list violations that it uncovers. Factories workers live in cramps dormitories, with to 20 in a room and each workers space limited to a bed on a bunks bed. Some say prisoners in jail live in better conditions. In some cases conditions are getting worse rather than better. The companies are just better at manipulating the workers and hiding the offenses. As far as pressure from abroad, Chinese companies are responding more to demands by retailers such as Wall-Mart to cut cost rather than calls by human rights groups to improve working conditions. Taiwanese and Korean factory owners have a bad reputation. They are regularly described as "greedy" and "lecherous" and sometimes provide wages as little a 12 cents an hour or $15 a month. There are stories that force workers to work until midnight, fire them when they complain and beat them up if they try to claim their paycheck. Worker can't complain to police because the factories have connections with the police. The most draconian factories do not allow their workers to leave the factory compound and deny workers bathroom breaks, demand sexual favors. At one prison-like Taiwan-owned factory that had a hundred guards watching 2,700 workers, a worker died during an escape attempt. In some factories workers are only allowed to shower once a week and workers are kept locked inside buildings that have their windows covered and the doors bolted shut. In some cases the meals are cabbage and potato soup served three times a day. To keep girls from quitting some factories require that provide a deposit of two weeks pay and turnover their ID cards. The deposit is illegal and the girls need their ID cards to take on another job or remain in the city. Korean employers in China have been accused of beating and humiliating their workers. In one extreme case a woman was locked in a cage with a large dog and put on public display in the factory compound. According to a Chinese newspaper 9 out of 10 spontaneous strikes in the city of Tianjin occurred at Korean-owned factories. The problem is particularly acute in Qingdai, a coastal town a short distance from South Korea by boat, which has a large number of Korean-owned factories. Most of the Koreans have decided to leave because rising labor costs and declining tax breaks have squeezed profits and made China no longer as attractive as it once was. Wages in Qingdao rose 43 percent over three years to $107 a month in the mid 2000s. Many companies left for Vietnam or Cambodia where labor costs are lower. Inside Chinese factories Chinese factories are very dangerous and every year there are hundreds of thousands of fatalities and injuries. Welders rarely wear masks, workers disappear into uncovered holes, and arms or heads are sucked into limb-eating machines. Many factories are illegal because they have workers working and living in the same building where toxic chemicals and flammable material are used. There are factory safety rules on the books but as is the case with most labor-related laws, the laws are rarely enforced and when they are the punishments are light. Many factory skirt the laws by bribing officials. Many of the victims are migrant workers, who are so desperate for any kind of job they take jobs generally regarded as too dangerous for most people. Workers are widely exposed to toxic chemicals. Workers at zinc-plating factories have had there hands seriously burned from caustic chemicals. They also work with very dangerous machines. In many cases the are forced to work at these machines with little training for just a few cents an hour. factory conditions Industrial accident and death rates in China are among the highest in the world, killing more than 100,000 people every year. The industrial death rate in 3.85 per 100,000 in 2005. More than 127, 000 people are killed in work-related accidents in 2005, down from more than 140,000 in 2002, and down from 109,000 in 2000. That works out to 380 deaths per day. A high number of people are killed at fireworks factories, on river barges, in work-related road accidents and in mines. Workers get run over by forklifts, fall at construction sites, inhale toxic chemicals and get blown up in explosions. Workers have been killed in fires in Shenzhen factories that made Christmas decoration and lawn furniture. Workers have been killed in fires because owners locked the doors out of fear that the workers would steal the products they were making. In January 2007, a fire at a an underwear factory in Shenzhen killed seven people. The Washington Post described a 19-year-old that worked long hours for two months in a busy factory that made stuffed toys in southern Guangdong province. One night she complained of pain and exhaustion and started bleeding from her nose and mouth. By the time she reached the hospital in an ambulance she was dead. Newspapers listed her death as guolaosi (“death from overwork”). Life is cheap in China even today. According to the Economist, if you kill a day laborer with your car the matter can probably be settled mater for $1,000. Workers chewed up by a machine maybe get $3,000 in compensation. Many don’t get any compensation. living conditions of workers Factory workers regularly loose limbs in industrial accidents, get burned by scalding water, chemicals or metals; are hurt in vehicle accidents. Reasons for accidents include shoddy equipment, poor training, inattention because of overwork, collusion between factory owners and officials to ignore safety regulations and lack of union support. In many cases the workers are not compensated and in some cases not even paid for the time they put in before the accident. According to government statistics 30 workers lose a limb every day at Shenzhen’s 10,000 factories. In most cases the factory owners pay a token compensation and hire new workers for $50 a month. Accidents in factories with machines that cut and shape metal with outdated technology machines are particularly nasty. In typical accident a worker works at mold pressing machine in which a hammer, with 1,800 kilograms of pressure, presses down on his hand instead of a piece of melt reducing the fingers to pieces of pulp. Other nasty accidents occur when workers get their hair or clothing caught in machines. One worker lost both of hands at a factory where he operated a large metal press seven days a week for 12 hour shifts. The maiming accident occurred at 2:00am in the morning when he slipped and the hot pressed dropped on both of his hands. The factory paid the medical costs but said the responsibility to pay for long term compensation was the responsibility of the local government labor bureau, which offered him a one-time settlement of $14,500, which the man felt was not enough. Zhou Litai, a labor-rights lawyer in Shenzhen has won more than 100 cases suing factories for compensation payments for injured workers. He also rents out of four-story apartment to provide shelter for 40 workers who lost their limbs in factory accidents. When challenged in court cases factory owners often say the accidents are caused on “operator errors” not safety problems. factory workers documentary Hundreds of thousands, likely millions, of workers suffer from occupational diseases. They vary in severity. Many are life-threatening or career-ending. Individuals and families are ruined not only by the disease but by the high medical costs of treating them. Most workers have little or no insurance. Seven young Chinese women suffered permanent lung damage and two died after working for months without proper protection in a paint factory using nanoparticles. About 558,000 Chinese workers suffer from lung diseases. Most are miners, but there are also many metal workers and construction workers. Silicosis is a dangerous lung disease caused by exposure to dust. 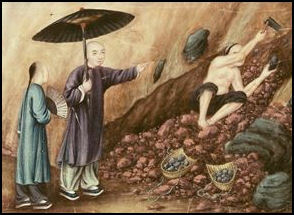 Known to Chinese workers as dust lung, it is caused by inhaling quartz (a mineral with silicon, hence the name) and over times weakens workers and eventually kills them by cutting off the oxygen supply to the lungs. Miners get it working mines filled with quartz dust created by drilling. Workers in the workshops that make jewelry, bricks, glass and ceramics also get it. Poisoning is another serious problem. Hundreds of thousands have fallen victim to acute poisoning in work-related accidents and hundreds of thousands other suffer from chronic poisoning picked up while working. By some counts more than 25 million people are exposed to toxic chemicals and disease-causing dusts in the work place every day. Some shoe factories are filled with fume levels ten times above safe levels. Teenage girls that glue soles on shoes are poisoned by fumes. In some cases the poisoning is so severe they become paralyzed. The Washington Post interviewed one woman who glued together sneakers on shifts of up to 17 hours a day. After working at the factory for few months she began to experience numbness in her fingers and ankles. Over time the numbness spread up her arms and legs. By the time she realized that the glues she was using was destroying her nervous system she was paralyzed from te neck down. Not only was her health ruined but the medical bills ruined here family. To reduce the danger of chemical poisoning, factories have installed better ventilation, switched to less toxic chemicals, and given workers gas masks. poor conditions at toy factories In December 2009, 17 workers were killed by a gas leak from a blast furnace at Ganglu Lu Iron and Steel Co. in Hebei, 150 kilometers east of Beijing. In June 2009, an explosion at a factory in Anhui Province that processes quartz sand killed 16 people and injured 43. The factory boss---Cao Peijun---was charged with illegally storing explosives that triggered the blast. More than seven tons of explosives were stored in an office. Cao was captured by police after withdrawn $292,000 from bank and making a run for it. An explosion at a chemical explosives warehouse in 1995 in Hunan province killed 90 people, injured 400 and left a crater 100 feet in diameter and 30 feet deep. The owner was suspected of breaking laws regarding the storage of explosives and many of those killed were children playing at a video arcade next to the warehouse. In April 2002, 21 people were killed in a fire in a food processing plant in the city of Qingdao in eastern China. The fire broke out just after midnight when 500 workers were still inside working. In April 2004, nine people were killed and 150,000 were evacuated after explosion at a chemical factory in the industrial city of Chongqing. The accident released large amounts of toxic chlorine gas and was blamed on out-of-date equipment and negligence on the part of workers. More than 30,000 people had to spend the night in tents. In October 2007, a fire at an unlicensed shoe factory Putian city in southeastern Fujian Province left 37 dead and injured 19 people. The blaze started at night in a workshop making shoe uppers. There were 56 workers in the factory at the time of the fire. None of them escaped uninjured. Falty wiring was blamed. 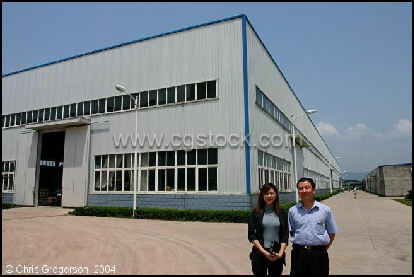 The owner of the factory and her husband were arrested. 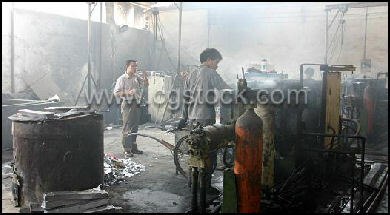 A factory fire in Shenzhen in February 2008 left 15 people dead. In May, six people were killed and 13 were injured in a fire at a fashion accessories factory in Yiwu in Zhenjiang Province. In August 2010, 19 workers were killed and five were missing and 153 people were injured after a massive explosion at a fireworks factory in the city of Yichun in Heilongjiang Province. About 50 workers were working in the factory at the time of blast which was powerful enough to be felt five kilometers away. The explosion damaged nearby buildings and set off secondary blasts. Industrial accidents are common in China and are often blamed on widespread disregard for basic safety measures. Xinhua reported that the explosion happened at a plant that belongs to Shandong Liaherd Chemical Industry Co Ltd, according to a statement issued by the Xintai city government. Four workers were killed outright and ten more died in hospital, while another five injured were in a stable condition, said the statement. An investigation into the cause of the blast is under way. Melamine is a nitrogen-rich chemical used to make plastics and other products: however, Xinhua said no poisonous or harmful substances were released by the explosion. In November 2003, 11 people were killed in an illegal sand mine when a villager blew up gunpowder in the mine, causing a sand wall to collapse on him. Ten of the men were killed when a sand wall collapsed on top of them as they attempted to rescue the first man. In November 2005, a cave in at the Kangle Gypsum Mine in Hebei Province killed 33 people. One miner was rescued after 11 days in a collapsed shaft. In November 2005, a cave in at a mine in Xingpai near Beijing that produces stone too make plaster killed 18 and trapped 22 others. In June 2006, the government approved tougher penalties for companies and people blamed for accidents in the workplace. The maximum term for people who cause accidents by forcing people to work in dangerous situation was raised from 7 to 15 years. The changes was prompted by a series of mine disasters.